Y’all should have seen Jorge’s face when I put this in front of him for breakfast. It had been an incredibly crappy morning with getting the news that our 10 year old puppy Brody (he will always be a puppy to me) has glaucoma in his good eye. Our little old man just can’t catch a break. We are thankful to be able to try to manage it with drops for a while, but eventually he will be blind in both eyes and require surgery. So like I said, it was a super crappy morning. When Jorge walked in, I had these donuts coming out of the hot oil and the house smelled like heaven. I quickly tossed them in sugar and topped them with fresh sweet strawberries and whipped cream. YUM. And of course we gave Brody a donut hole too. Y’all know how much I love donuts (hello – I wrote a cookbook about them), but this is one of my absolute favorite things to make for weekend breakfast. I usually just toss them in cinnamon sugar and call it a day, but with all the gorgeous local strawberries around here lately I knew I had to make them into big strawberry shortcakes! I am so glad I did because they were one of the best donuts I have ever made. 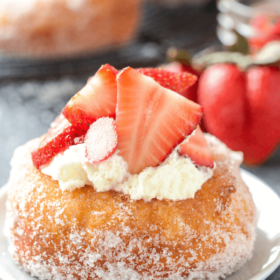 The donut is warm and soft and the whip cream sweet and cool…then juice strawberries on top! These donuts come together super quick since they use canned biscuits! And I know you might think that sounds crazy, but I swear they make awesome donuts and you don’t have to wait for dough to rise. I have done many recipe tests and the best biscuits to use are the “butter tasting’ homestyle” ones form Pillsbury. I know that the name sounds ridiculous, but they making some delicious donuts one you fry them. Two things that make these donuts even easier — an attachable thermometer to make sure your oil stays at the perfect temperature and a donut cutter to easily cut out the centers. Hope you and your family enjoy these as much as my family does. The girls couldn’t stop saying “mmmmmm” as they ate all of the donut holes! In a medium bowl, toss together sliced strawberries and 2 tablespoons sugar. Set aside. Line a plate with paper towels for draining donuts. Set aside. Heat oil in a large deep pot to 350°F. Using a 1 1/2 inch biscuit/cookie cutter, cut out the center of each biscuit. Fry each donut until golden brown and then flip and fry the other side – about 1.5 to 2 minutes on each side. Drain donuts on paper towels for 30 seconds and then toss in the remaining sugar. 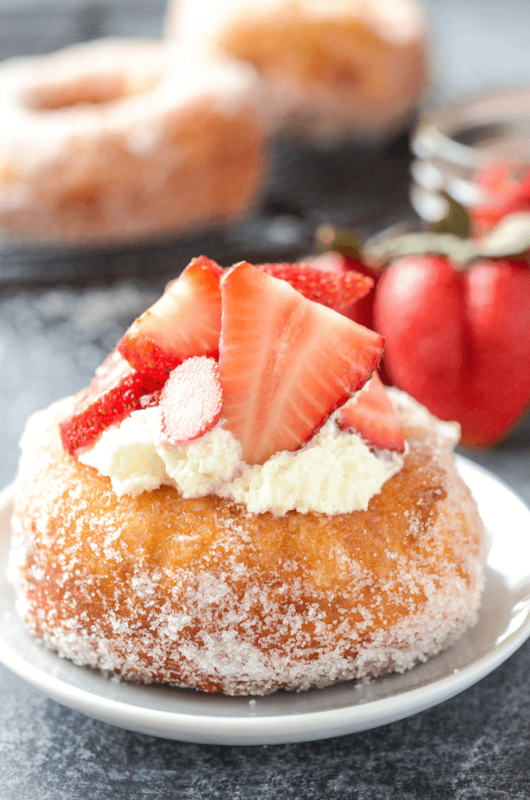 Let donuts cool for 5 minutes (they will still be warm, but not too hot) and top with whipped cream and strawberries. Serve immediately! On a GOOD note, these donuts are the best thing I’ve seen all morning. Poor pup, I can just imagine how hard that is for your family…glad he got his donut. And I’m loving how simple these are to make, I HAVE to try making donuts with biscuit dough…yum! If I saw these donuts in a donut shop, I’d be all over them! Great flavor you’ve created! And they’re gorgeous too. Awww poor little pup 🙁 I’m worried about that with our dog too. She turns 11 next week so I’m sure age related issues are going to start cropping up. In happier news, these donuts look fabulous! So sorry about your pup. 🙁 But I know these donuts would cheer me up! Oh man, these look SO amazing! They are absolutely beautiful! Poor Brody! I hope the drops help for a while. You always make the best sweet treats! 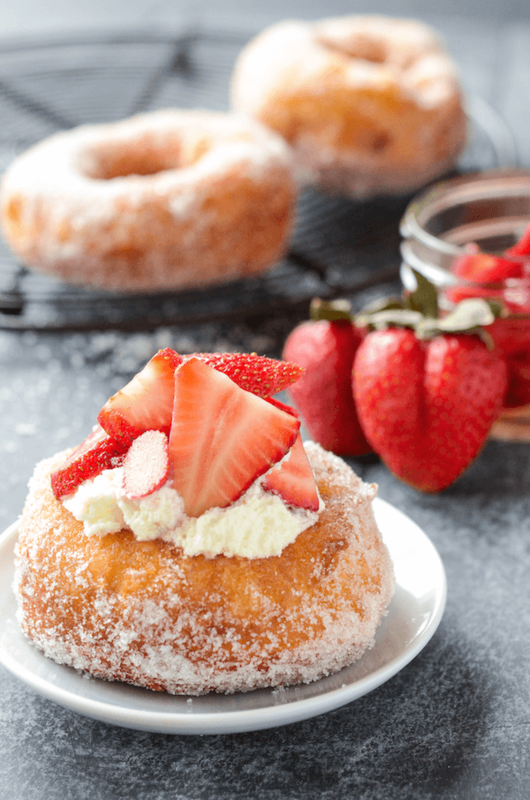 These shortcake donuts are incredible and just what I need to satisfy my craving for sweets. 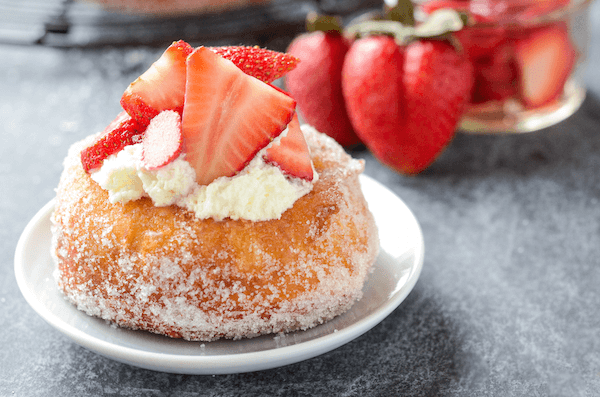 I love any kind of donut … but strawberry? Divine! Poor puppy! Our one cat is blind and it’s so hard. She has one eye that can see shadows but she is slowly losing that ability. Sigh – it’s hard. 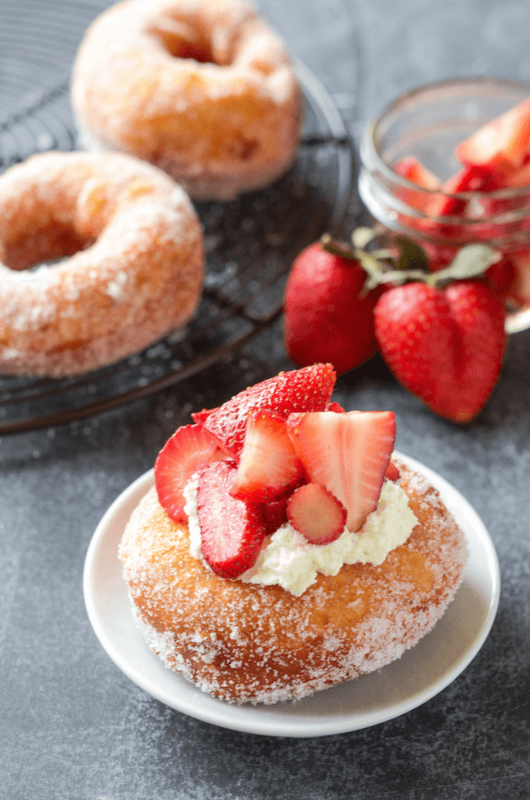 These donuts looks great and I love how simple they are do make! Your poor pup. I am so sorry 🙁 I will say, however, if anything can help things look a little less sucky, it’s definitely a hot doughnut! Especially one covered in gorgeous sugar and strawberries! These looks so great…does anyone think I could use an air fryer? This is a Friday Fave for sure! SO GOOD! Sorry about your puppy 🙁 in other news, these donuts look fabulous! Love how easy they are!